with the clearly smart thermostat. Designed with arrival anticipation and occupancy detection, GLAS® intuitively monitors your schedule so when you’re home, you’re comfortable. GLAS isn’t just elegant. It’s always working. The GLAS smart thermostat monitors and reports indoor and outdoor air quality so you can manage and be aware of the air you breathe. 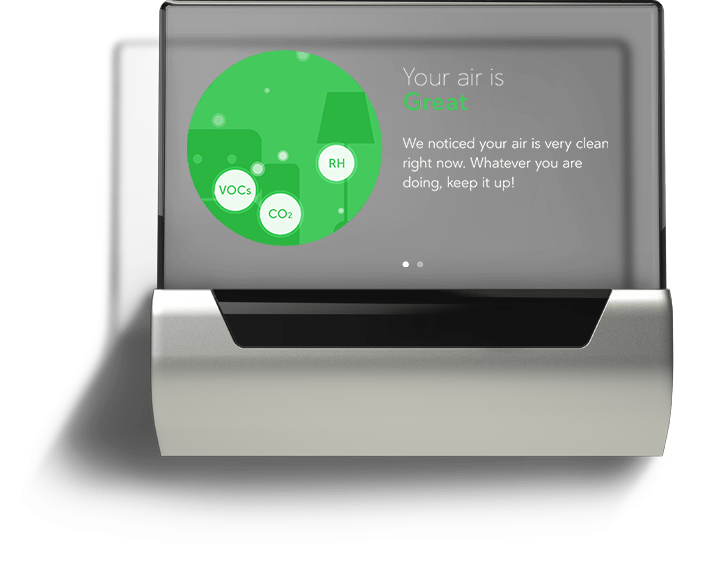 Indoors, GLAS provides real-time reporting on relative humidity, total volatile organic compounds (tVOCs), and equivalent carbon dioxide (eCO₂) levels. Outdoors, GLAS provides real-time air quality reporting on allergens (tree pollen, grass pollen, ragweed pollen, and mold), UV index, and the air quality index (AQI), which includes ozone levels. Plus, you can schedule reminders to change your system’s filter and for maintenance visits. Just a few less things to keep track of. Getting things set up – your way. GLAS, powered by Windows 10 IoT Core, gets to know you and your home right out of the box. It’s easy to set a 7-day temperature schedule on the smart thermostat or from your phone or tablet. Home, Sleep, and Away modes ensure an even more personalized space, while its delightfully easy-to-read display provides clear information. No more squinting at cryptic settings. Most importantly, it knows when you’re home and when you’re not so it can adjust the temperature – and your comfort – accordingly. GLAS integrates with smart home devices. 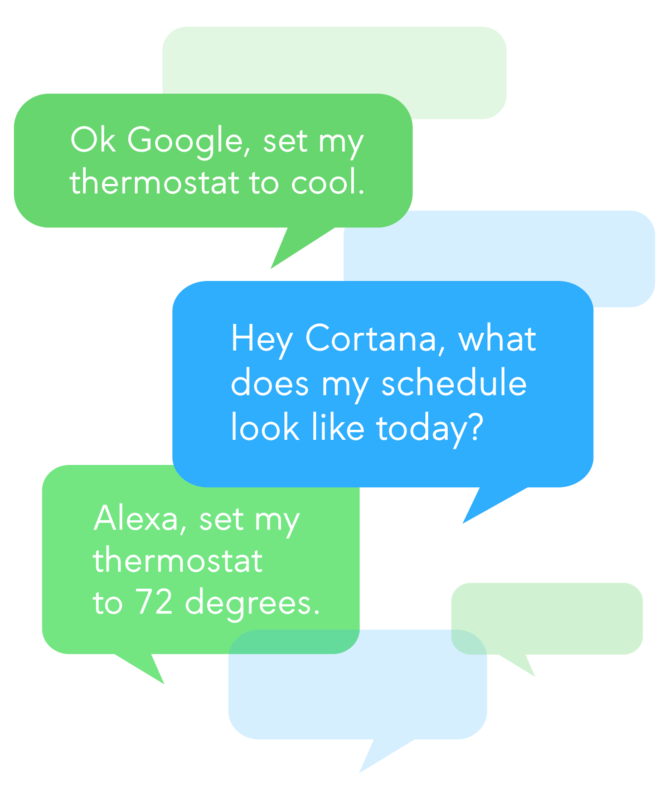 GLAS is built with the Microsoft Cortana® intelligent assistant in the device. To enhance smart home integration even more, GLAS also works with the Google Assistant and Amazon Alexa when connected to Alexa-enabled devices like the Amazon Echo. Adjust the temperature, dim the lights, and more. All with the sound of your voice. So much more than a wall. Get to know GLAS by watching these informational instructional videos. Click on a tab below for videos on that topic. From energy savings to air quality monitoring, and from the seamless experience to simple voice commands, GLAS helps you create the home you want to live in. GLAS provides an intuitive, engaging experience whether you’re interacting with the device, your mobile phone, or your tablet. You can download the GLAS smart thermostat app to manage your GLAS on your mobile phone or tablet. GLAS adapts to your schedule to intuitively and attentively maintain a comfortable space while it saves you energy. 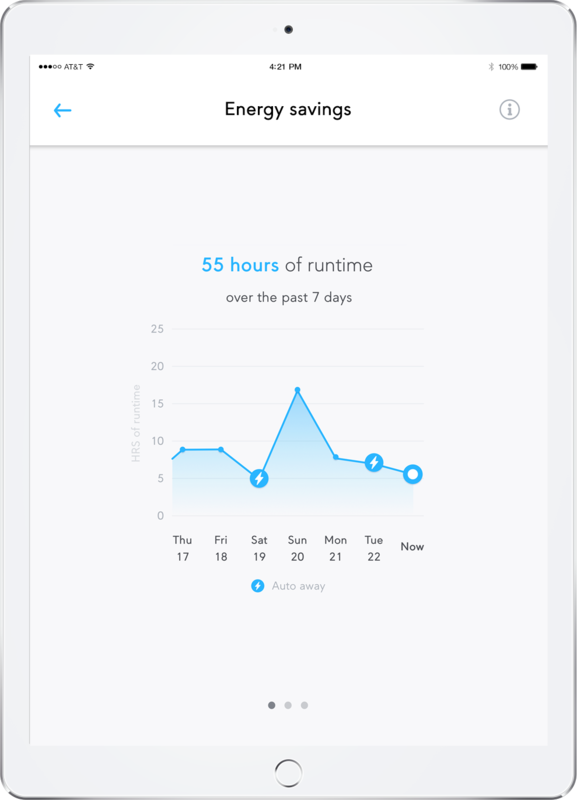 GLAS helps you to save energy and then shows you how much you saved. GLAS anticipates your needs and keeps you in mind, so you can focus on what’s important to you – so when you’re home, it feels like home. The GLAS smart thermostat monitors indoor relative humidity, total Volatile Organic Compounds (tVOCs), and equivalent CO₂ (eCO₂) and intelligently adjusts for you. Especially helpful for allergy and asthma sufferers, GLAS monitors pollen and air quality outdoors. GLAS proactively guides you to realize spaces that are healthier and more comfortable so you can breathe easy. 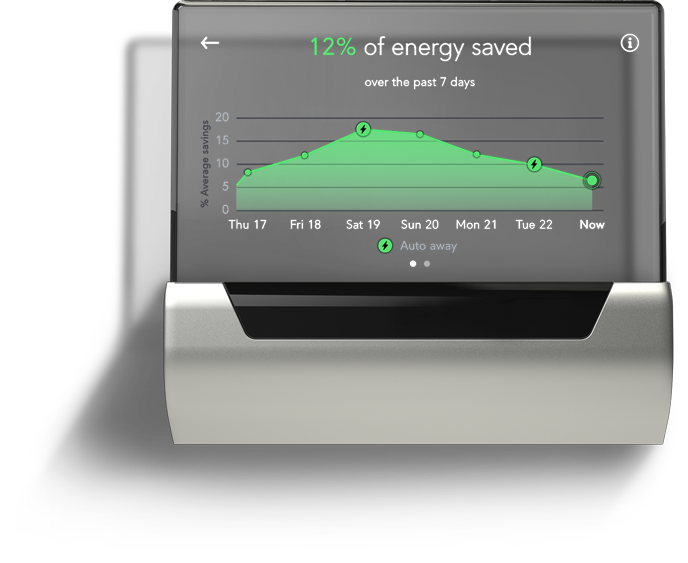 GLAS helps you stay comfortable while you save energy. Working with your individual preferences, GLAS will maximize your energy savings while you’re away, and make your space comfortable before you arrive. Delightful interactions. Beautiful across any device. 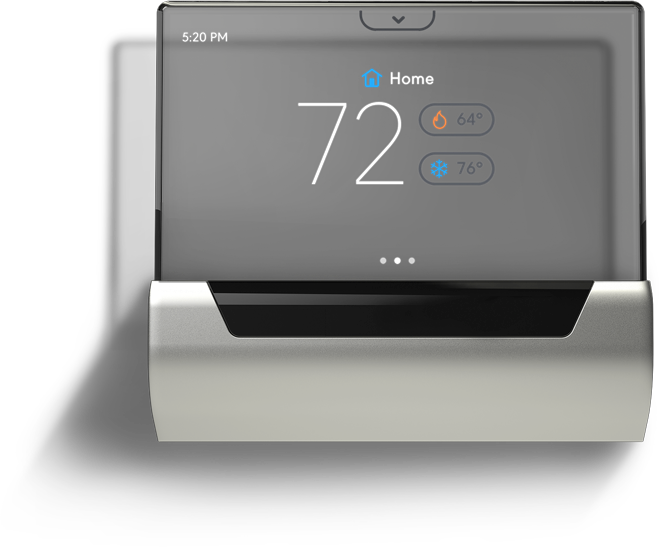 With the GLAS app, it’s easy to control the temperature in your home from your smart phone or tablet. Simple interactions with the same intuitive interface across all devices. Tweak the temp without touching the thermostat. Keep up with your energy savings through real-time energy reports. Compatible with Android (4.4 or later) and iOS (10 or later) mobile devices. Ready for a smarter, more comfortable home? Sign up for GLAS updates.